Electronic Arts founder Trip Hawkins made a prediction at the Engage Expo in Santa Monica on 22nd September 2010 (Offerpal Media blog), that the global virtual goods market has the potential to become a $100 billion industry. He stressed to games industry developers at the expo the need to facilitate the growth of social media games especially through them being “interoperable across all media, all platforms, all devices, because people want simplicity”. In the space of just over a decade, virtual game goods have gone from being a black market cottage industry (MMORPG genre i.e. 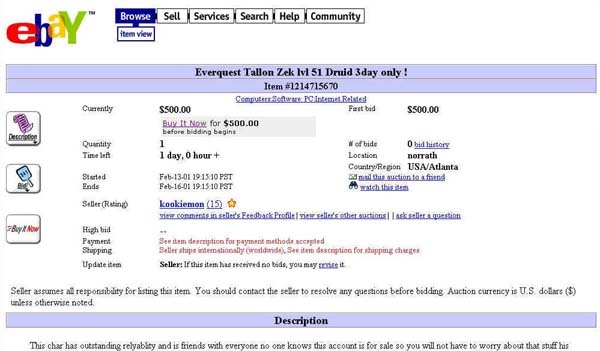 Ultima Online and Everquest gold farming & character sales (see fig.1) on ebay etc.) to an extremely successful business model for gaming and social networking virtual goods industries. This evolution, caused by player driven demand for purchasing virtual goods lead to social media and game industries implementing virtual currency systems and sale of virtual goods as one of the main focuses of their business model. This new industry developed as a symptomatic response to this growing appetite for virtual goods. The incredible popularity of social media networks such as Facebook, MySpace, Flickr et al has been due to a combination of factors. People increasingly want to socialize, share experiences, customize content or get other users’ feedback. According to Vili Lehdonvirta’s doctoral research paper ‘Virtual Consumption’ (Member of the Virtual Economy Research Network) he describes the rise in consumption of virtual commodities as stemming from a desire for a satisfaction of needs, social status and identity. Prior to the explosion of social games onto new social networking platforms in 2008, there was already a huge market for intangible goods in virtual worlds, such as the hugely popular MMORPG World of Warcraft (WoW) and 3D environment Second Life. For in-game goods sold in immersive worlds like WoW, developers restrict players from selling their virtual goods for real cash. It is a locked-in or closed virtual currency, and as such players can only purchase additional virtual goods. A player can build a character or create an item for sale only for in-game virtual currency. This also led to players looking for black market virtual game goods, which unfortunately also saw the rise of virtual game goods sweatshops in Asia and other developing countries. In the 3D virtual world of Second Life, the emphasis is on creating, collaborating, socializing and building social communities. They are in the business of facilitating the creation or production of natively online cultural products. Second Life citizens can buy Linden Dollars and exchange them on a virtual exchange, you can also set up a shop or store selling your own virtual goods for real money. Second Life and other immersive worlds such as IMVU, with their emphasis on user generated content share similarities with what Mizuko Ito’s described as the constructivist genre of educational software. She concluded in her book ‘Engineering Play’ that as an educational tool this genre was the most successful for developing skills and learning as it encouraged self-development, creativity and collaboration. These worlds also encourage skill acquisition, sharing and socialization. As already stated, casual games started appearing on social networking sites such as Facebook and MySpace in 2008. These casual games immediate popularity saw these games leap cross-platform to iPhone and other smart phones. Zynga’s ‘Farmville’ is currently the top ranking casual browser game and this company was the last big developer to announce they were making the Facebook credit system their ‘only’ form of payment on that particular platform. This credit system came to light over a year ago and caused a stir among game developers who already had their own independent micro-payment systems. Facebook obviously sensing the massive potential and growth of this casual gaming boom, and the high volume of virtual goods sales, decided it wanted to capitalize too and so is changing developers a whopping 30% commission on every micro transaction. This drive towards virtual goods came about organically, the impetus was user created. The early black markets were a response to a demand for virtual goods mainly by the desire for improved social status, personalization/customization and new identities. Both gaming companies and social networking sites started to see the huge potential in adapting this new business model. We are also seeing a shift towards the development and use of augmented reality apps for mobile phones and other hand held devices. While in the early days, augmented reality is a whole new market yet to populated with virtual goods. Williams, Raymond. The Technology and the Society. Ito, Mizuko. Engineering Play: A Cultural History of Children’s Software. Cambridge: MIT Press, 2009. I can see what you are saying. You see it everywhere even on your cell phones. Every kid from the age of three up know how to play some type of game on something. I like that they are making them to where you have to do some kind of interaction with them now. Otherwise we are going to have a bunch of couch potatoes growing up.